A video of African-American high school student Michael Brown went viral at the beginning of April after Brown was accepted by all 20 colleges he applied to. Four of those were Ivy League universities — Harvard, Yale, Princeton and the University of Pennsylvania. Each institution awarded Brown with a full ride scholarship. He has not made a final decision yet, but he does know he will study political science. Brown earned a 4.68 GPA, a 1540 SAT score and 34 ACT score at Lamar High School in Houston. Many people praised him for his achievements, including former President Bill Clinton. However, a local Fox news station in Washington, D.C. has been facing backlash for harshly criticizing Brown. Morning co-anchors Holly Morris and Sarah Fraser bashed Brown for applying to 20 schools, calling his success “obnoxious” and “ridiculous.” They suggested he was trying too hard and was simply showing off. The video from NowThis said that taking away spots from other students is a common argument used against students of color. But Black and Latinx students are more underrepresented at top colleges today than they were 35 years ago. To say Brown didn’t work just as hard to earn his acceptances doesn’t make sense. Getting accepted to college does not take a space away from anyone. A school will not just limit the number of enrollments or only give a small amount of financial aid to other students if Brown decides to go elsewhere. He will only pick one school. He’s not taking a spot at all 20 schools he applied to. He clearly earned his success and worked incredibly hard to get into every school he applied to. Applying to colleges is not an easy process, either. Most school applications have fees. The fees range anywhere from $45 to $75, with some colleges costing as much as $90. Harvard’s application fee is $75, Yale’s application fee is $80, Princeton’s application fee is $65, and the University of Pennsylvania application fee is $75. Some students are given fee waivers but only a limited amount of them. When students take the SATs some are eligible to receive college application fee waivers as long as they registered to take the SATs with a fee waiver. They give students up to 4 application fee waivers. Students can request colleges for fees waivers as well. Usually, colleges will approve their requests if a school counselor or another official signs off on it. There are even essays for each of the schools that can be really difficult to write, especially for Ivy League universities. 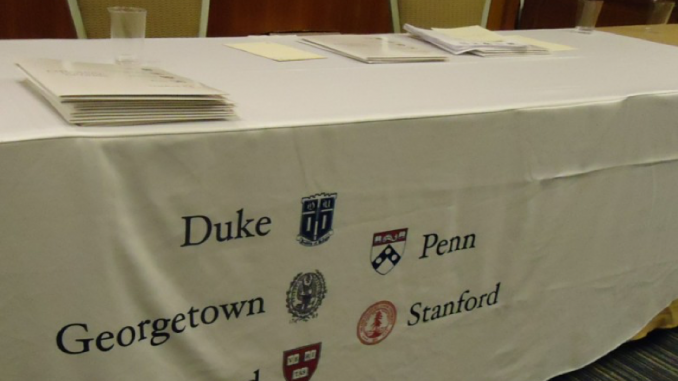 Both Harvard and University of Pennsylvania require interviews while Yale and Princeton strongly recommend interviews. Applying to these extremely competitive schools is not a simple process. So to apply to 20 different colleges where some require a rigorous application process is amazing and definitely something to congratulate, not criticize. Brown had a Skype call with Morris a few days after, but he said she didn’t apologize for her comments. Morris took to Twitter to say that Brown was “amazing” but continued to stand her ground in believing he applied to too many schools. Fraser apologized to Brown on Twitter and said she sees now how her comments were unacceptable. Students have the right to apply to as many colleges and universities as they want. It is very reasonable to apply to many schools. Students apply to multiple ones because one might give a better offer than another and some students want to have more than one option before finally deciding. It is not “obnoxious” to want to have multiple options. Adults should be congratulating all students like Brown, not undermining their success. Micheal Brown was involved in several programs designed to place low-income students in elite colleges with large endowments. Either those programs or the sources you mentioned covered his application fees. The student in New Orleans who applied to 100 colleges and was accepted by 83 institutions with more modest budgets. His application fees would have been between $4500 and $7500. I don’t know his family income level, but I suppose it is possible that someone could have applied to 100 colleges for free and I guarantee there will be a limit on fee waivers if this number of applications becomes a trend. A WFMY video says that Jasmine Harrison applied to over 700 colleges and received 113 acceptances with three being full-ride scholarships. She only paid $135 to apply to the 700 colleges. Another report says that she will major in biology and wants to become a NICU nurse.